This is an idea that was presented a couple of years ago at Convention. It uses the Season of Thanks Decor Elements (size medium) applied to the front of a display frame. (The proper name for this type of frame is escaping me right now... it must be time to get off the computer.) I love getting this out each year and hanging it on the wall. It's just the right size for another picture that I keep up most of the year. That goes into the closet and this one gets hung up as soon as I start to feel "fall-ish". I finally remembered last night - it's called a "shadow box" frame! 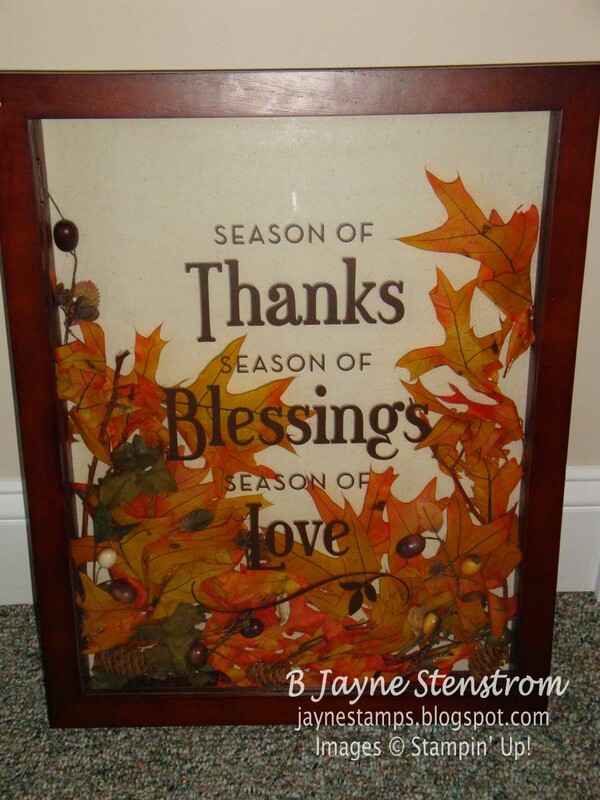 I purchased the leaves, mini pinecones, and acorns from a "big box store" and placed them in the frame. Because they're not "real", I don't have to worry about them rotting or going bad. Plus I really like the colors - and do you know how long it would take me to find enough leaves in the colors I wanted? You can find this Decor Element in the Definitely Decorative catalog on page 11. It's available in black or chocolate and in small or medium. It's a great way to re-use your seasonal Decor Elements from year to year! Feeling "fallish" - the leaves are almost off all the trees silly girl!! Very pretty frame, but if you wait too long you'll have to design a Christmas one w/ snowflakes that don't melt! I love this card. So very pretty!